Great news, the The Story of Us Project Idea Sheets are now available for download! Visit the Project Downloads section of our website to download Project Idea Sheets from our past collections. Did you know we also have free, downloadable Simple Inspiration eBooks for each of our newer collections as well? You can see those in the Project Downloads section of our website as well! To see more projects using our The Story of Us collection, visit our The Story of Us Pinterest board here! Let's start off with a Good Day Sunshine layout about an opportunity my daughter had to take classes at her dance studio with choreographer Kim McSwain. I turned the photo black and white so I could work with all of the colors in this fabulously happy collection. The colors not only reflect Kim's upbeat personality, but also the fun time my daughter had. Even though Good Day Sunshine is primarily a summer collection, you'll notice it certainly works equally well for other topics. For this cluster, I layered up a number of items from the Bits & Pieces pack. Grouping them together like this gives them a cohesive look. The enamel dots are a fun way to add dimension and groupings of color. In this detail shot, you can see more elements from the Bits & Pieces pack, again layered together to create a grouping. Next up I have a Homespun layout to share. Simple Stories was the featured manufacturer in Scrapbook Generation's CREATE magazine last month. This is one of my projects that appeared in the issue. I used one of the Snap Pockets as a design element next to the photo, layering other items on top of it. The "hello" card inside the pocket is actually product packaging from an iPhone. A Kraft Tag from the DIY collection provides the perfect foundation for chipboard and die cut embellishments and provided a way to ground them to the page. You may have noticed I used three tags around the page — one larger tag, and two smaller ones. Odd numbers of embellishments are more pleasing to the eye and create a visual triangle to help move your eye around the page. This second detail shot shows another mix of embellishments, also grounded by a Kraft Tag. Thanks for stopping by today. I hope you enjoyed getting a look at Good Day Sunshine and Homespun in action. Hi! Kim Kesti here with some great summer themed cards for the patriotic at heart. I have loved crafting with the Sea to Shining Sea Simple Set; we have three summer birthdays in the family with my Mom’s birthday actually on the 4th of July! This first card is specially made for her. This next one is a fun mix of beach and patriotic themes. Love that lighthouse! And lastly, a great card for anyone who loves the Good Ole USA! Thanks for letting me share these fun cards. Enjoy your special summer and make lots of great memories, okay? Howdy! Layle here today to share some fun news - we have 80+ brand new cut file designs, including new Print & Cut designs, now available for the Silhouette! Guess what?! Now through July 14th, all Travel and Seasons themed designs are 25% off at the Silhouette Online Store! Now's the perfect time to pick up a few of your favorite cut files at 25% off, including that fun 'Here We Go' cut file above! How about a little incentive to head on over and check out these and our other fun designs here at the Silhouette Online Store?!! Head on over, take a peek at all of our designs, then hop back here and leave a comment on this post via the Rafflecopter widget telling us which design is your favorite. 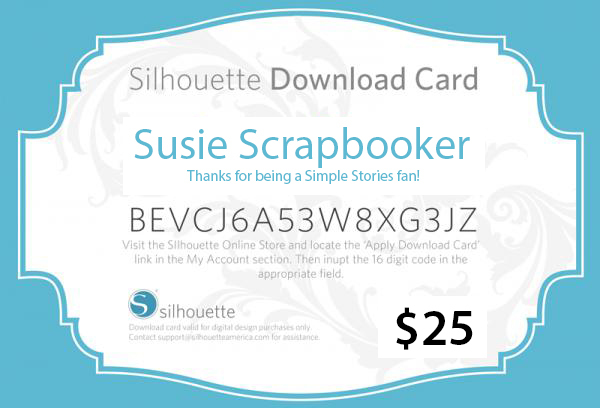 On Tuesday the 1st, we'll draw one random lucky winner to win a $25 Download Card to the Silhouette Online Store! Hey everyone! Andrea here with you today to share a fun board book made with the Good Day Sunshine collection from Simple Stories. The wood grain papers and embellishments in this collection give it a “beachy” feel that make it great for your outdoor summer photos. This book is made from chipboard pieces cut to 5 1/2 x 10, and is held together by O-rings. Once I had all my pieces cut, I covered them with papers from the collection and sanded all the edges to give it a weathered look. I added SN@P! Cards on the ends of some of the pages and tied ribbon around the entire page to add an extra element. The cover has some paper flowers attached to the ribbon by a decorative brad, and I hung some beads and a button off of that for visual appeal. Once the pages were covered I added my photos. I matted them on white cardstock so they would stand out against the background. The photos show how we spend our summer days, and this album will be our summer “coffee table” book. Once the photos were added it was on to embellishing, and when it comes to that, all I can say is, “LAYER, LAYER, LAYER”! There are so many items in the collection to choose from, and all those embellishments around a photo really draw your eye to the focal point of the page. The SN@P! Cards are great for this; place them behind the photo, and layer embellishments on to them. Did you notice all the Simple Stories Silhouette cut files I used in this book? Simple Stories has a TON of files to choose from, and they are great additions to ANY project. I especially love the new “tickets”! And what about the Clear Photo Stickers?! These things are so hot, it’s hard to get your hands on them - I love them! I hope you’ve enjoyed today’s post and you’re inspired to make up a quick “coffee table” book of your own! Howdy! Layle here with you today. Have you heard?! Creative Spaces Vol. 3 is now available! Back in February - funny, I just realized it was exactly 4 months ago to the day! - Paper Crafts & Scrapbooking editor Susan Opel came to our office in Ogden, Utah for a photo shoot for this issue. We had a blast showing Susan around our offices and talking about the issue! We're super excited to be featured in the In Good Company section, along with 5 other companies. Trust me when I say you'll want to pick up this most current issue of Creative Spaces, it's one of the best yet! Speaking of picking up the issue, how'd you like to win a copy of Creating Spaces Vol. 3 for your very own?! Enter via the Rafflecopter widget below by end of day Friday the 27th and one lucky winner will win his/her very own copy! Good luck! There's a fun Blog Hop going on to celebrate this fun new issue - hop on over to each of the blogs below and take a peek! Hello! Nichol here today with a new layout and card showcasing the new Sea To Shining Sea Collection. I am a huge fan of red, white and blue and this new Simple Set is perfection! For my layout share today I used some of my favorite Simple Stories polaroid cut files from the Silhouette Online Store to create polaroid "folders" to stick my photos inside, fold over and staple shut. It's super easy to customize the cut files and create folders. In the video below I'll show you how! I sized all the polaroid "folders" to 3" wide by 4.5" tall so that they would completely fill the width of my 12x12 layout. I placed my photos behind the polaroids with text cut outs and removed the text from the other polaroids so they cut smooth. I filled those with red, white and blue embellishments! I used a combination of letter stickers from Sea To Shining Sea and The Story of Us for my page title, replacing the "a" in "crabby" with the cute crab from the sticker sheet. I popped up some of the elements and stickers on my card for subtle dimension. Hi all, Layle back with you today. So how about all of that amazing inspiration this past week for the Simple Stories + Kerri Bradford Studio Designer Team Up?! I am blown away by not only what our team did, but with what Kerri and her team team did as well. What a fun week it has been! !